This ancient surname is of Anglo-Saxon origin, and is a locational name from the many places called Stoke, for example in Somerset, Warwickshire, Northamptonshire, and Derbyshire. In many instances the old forms of the placename appear in their plural form such as "Stoches" in the Domesday Book of 1086, and as "Stokes" in the Curia Regis Rolls of 1206. The name is derived from the Olde English pre 7th Century "stocc", stock, trunk of a tree, Middle English "stoke", thus, "the place of the stump-clearings". The surname dates back to the late 11th Century (see below). Early recordings include Cnut de Stock (1166) in the Pipe Rolls of Derbyshire, and Ailwin de Stokes (1195) in the Pipe Rolls of Northamptonshire. London Church Records include the christening of Benjamin Stokes on the 18th June 1570 at St. Peter's, Cornhill, and the marriage of Anna Stokes to Lott Arnold on the 18th January 1579 at St. Martin in the Fields, Westminster. 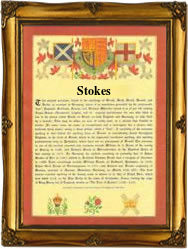 A Coat of Arms granted to a Stokes family is silver, on a blue chevron three silver trefoils, a red border bezantee. The first recorded spelling of the family name is shown to be that of Ricerus de Stochas, which was dated 1086, in the "Geld Roll in the Domesday Book", during the reign of King William 1, known as "The Conqueror", 1066 - 1087. Surnames became necessary when governments introduced personal taxation. In England this was known as Poll Tax. Throughout the centuries, surnames in every country have continued to "develop" often leading to astonishing variants of the original spelling.